KUALA LUMPUR, 9 Nov, 2010 – The National Heart Institute (IJN) and Universiti Kebangsaan Malaysia (UKM) today signed a Master Agreement to collaborate research and development in the field of thoracic and cardio vascular diseases which will later be joined by the University of Geneva, Switzerland. Announcing this at the ceremony the Vice Chancellor of UKM, Prof Tan Sri Dato’ Dr Sharifah Hapsah Syed Hasan Shahabudin hoped Geneva University’s involvement would not only be in research collaboration but will enable UKM to sent its students to do their studies at the PhD level at the University. She described postgraduate studies as an indispensable component of such research activities. 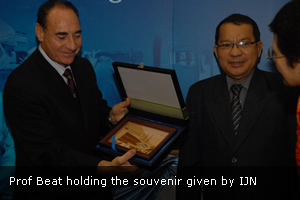 “This is UKM’s strength which I believe will also be the strength underpinning the UKM-IJN collaboration. Representatives from UKM and IJN had visited the research and training facilities in Geneva in March this year,” she said at the signing ceremony at the new wing of IJN in Jalan Tun Razak here. UKM had signed an MoU with IJN three years ago which had a tremendous effect on the development of cardiothoracic services at the UKM Medical Centre. “IJN is an institute that has inspired a lot of our students and graduates. We are proud that many UKM alumni are serving IJN from its conception until now. Today the Lung and Heart Centre has emerged as one of UKM’s Centres of Excellence. It is thus appropriate that it focuses on research under this MoA,’ she said. Prof Sharifah Hapsah said the government has agreed for UKM to develop its Children Hospital and hope IJN will be involved in the new Paediatrics Thoracic unit. The hospital will be built within two years. A committee have been established initially headed by Prof Dato’ Dr Lokman Saim, Dean of UKM’s Medical Faculty to implement the activities under the MoA. Two research proposals one from the Cardiothoracic Unit of UKM and another from IJN have been forwarded for consideration. Prof Sharifah Hapsah said the government had allotted RM800 million as research grant and wanted more proposals to be submitted. The Chief Executive Officer of IJN, Tan Sri Dr Robaayah Zambahari said through the five year collaboration between IJN and UKM, the university has agreed to provide its cutting-edge laboratory and research facility. UKM will also provide training in the research field to IJN personnel as well as support the effort by providing expertise and advisory support from eminent members of its well respected medical faculty. IJN on its part will assist by providing qualified consultant practitioners and personnel with the necessary expertise and skills to supervise and provide advice to the researchers. At the same time IJN will also provide professional training for post-graduate students, allied health personnel, doctors and nurses in the field of cardiology (both paediatric and adult), cardiothoracic surgery and cardiac anaesthesiology. This IJN-UKM collaboration in Research and Development is also in line with the Government’s efforts in the Economic Transformation Programme for Healthcare. Dr Jeswant Dillon, a consultant cardiologist from IJN later told the media that one of the proposal centered on research on the increasing number of young people (those below 40 years old) suffering heart problem. He also said IJN will be doing follow ups on more than 1,400 patients who had undergone repair on their heart valves. 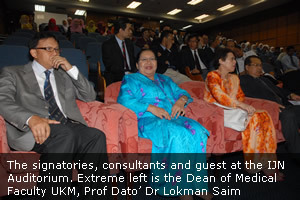 Prof Dr Sharifah Hapsah signed on behalf of UKM while IJN was represented by Tan Sri Dr Robaayah Zambahari. Professor Beat H Walpoth, Director, Cardiovascular Research Service of Cardiovascular Surgery, Geneva University Hospital was present to witness the signing with Tan Sri Datu Prof Dr Mohamad Taha Arif, Chairman Board of Directors National Heart Institute.